A Blender tutorial on how to install the Poliigon Material Converter addon. This addon will automatically create a material out of your texture maps. It supports Blender 2.79 and up, including the Blender 2.8 Beta. Open Blender then go to the file menu -> user preferences. Click on the Add-ons tab, then click Install Addon. Navigate to where you saved the .zip file and select it. Click on the check-box to enable the converter and, optionally, click on Save User Settings to have it always enabled on launch. For more information regarding using our converter please check out the Blender area of our Help Section for tutorials on subjects ranging from basic usage to more in-depth subjects. Include Ambient Occlusion (AO) maps - If ambient occlusion maps are present with the detected materials, they will automatically be added to the material shader setup. Include Displacement maps - If displacement maps are present with the detected materials, they will automatically be added to the material shader setup. Please note that some renderers only allow displacement via a modifier that must be applied to a 3d model. In such cases the displacement map must be added manually, as the script only imports textures into a material shader. Conform UV maps to image dimensions - For textures in a rectangular (non-square) format, this option will adjust the UVs for each map type to match the image dimensions. Please note that this feature does not work with all rendering engines and is disabled by default. Use 16 bit maps - This will replace all 8 bit images with higher quality 16 bit versions when available, and is disabled by default. The material converter is designed to function only when it detects materials that have a complete set of maps, and will give an error warning if one or more of these maps is missing. 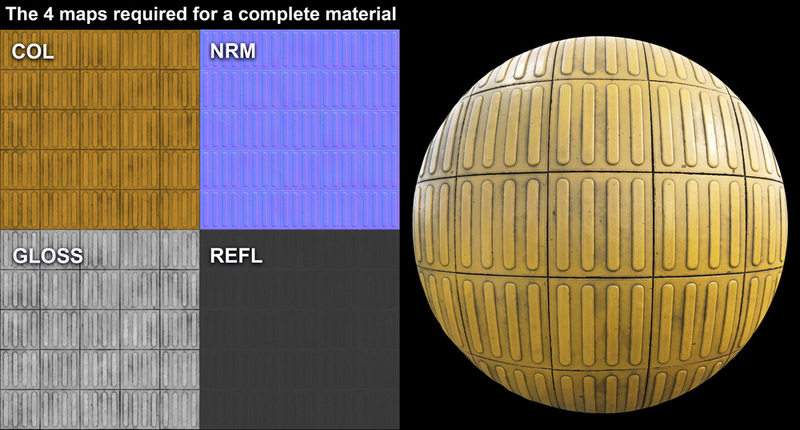 In order to form a complete material these four map types are required; COL (color), REFL (reflection), GLOSS, and NRM (normals). Please note that some materials come with ALPHAMASKED files instead of a COL map and contain a transparency channel. These will automatically load in if a COL map is not detected. All other additional maps that may come with materials are considered speciality and not required for the converter to work. However some of these are directly supported such as AO, Displacement and Alphamasked maps. When it comes to metal materials Poliigon offers two different workflows; metalness and specular. Due to the way Blender's Principled Shader works for metallic materials the specular workflow really doesn't work well therefor the Converter will insist you download the metalness workflow textures. If you encounter any bugs while using the converter then please contact our support team with the details at [email protected]. Thanks!